Arthur Conan Doyle - is he the mystery man? We receive many requests for information about Arthur Conan Doyle through our website! This recent request in particular caught our eye. Bill Becker from The American Museum of Photography wanted to tap into The Conan Doyle Estate's network of experts. The reason? A mysterious photograph with a question mark above a certain man's identity. "I'd like to send a photograph for your review. 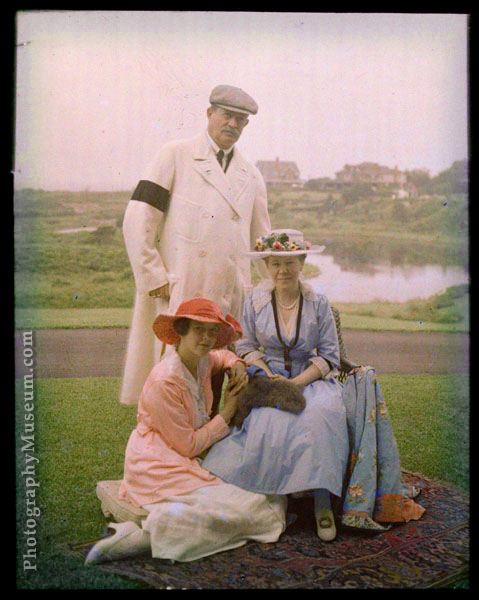 It's an early color image on glass, made by the Autochrome process, and it depicts three people. I'm curious to know if Sir Arthur is included in the group." "Here's the image, and a detail showing the gentleman and the houses in the background. I might be able to tease out more details with a new scan. This is an Autochrome, the earliest commercially-successful process of natural color photography. The image is on a glass plate." "Sir Arthur posed for an Autochrome on at least one occasion -- two portraits by Arnold Genthe, said to be from 1914, are in the Library of Congress." The family knew this wasn't Sir Arthur Conan Doyle - but we sent the photograph to Jon Lellenberg, one of the consulting experts that make up The Conan Doyle Estate. We were curious to know if Jon knew anymore... Jon replied with the below. "Interesting to learn that Arnold Genthe took a portrait photo of Conan Doyle, believed 1914 -- presumably when ACD came to New York at the beginning of his big trip across Canada, since that's where Genthe, born in Germany, was located and working at the time. What's interesting about it to me is that Genthe and Christopher Morley, the founder of The Baker Street Irregulars, were later good friends, though 1914 was before Morley would have met the considerably older Genthe." Bill has requested that if anyone recognises the gentleman pictured to get in touch directly with him. He would be happy to hear from anyone who has a theory! Contact details via the web link below. The American Museum of Photography Source.